Smoothie is a very healthy drink. This drink is made with fresh or frozen fruits. In addition to fruits sometimes it contains crashed ice, ice-cream, yoghurt in it. Smoothies have milk-shake like consistency. To make smoothies more healthier milk ,ice-cream or yoghurt can be replaced by soya milk, whey powder, green tea, herbal supplements, or nutritional supplement mixes. This drink is made with fresh or frozen fruits. In addition to fruits sometimes it contains crashed ice, ice-cream, yoghurt in it. Peel the mango and the banana and cut into pieces and keep aside. 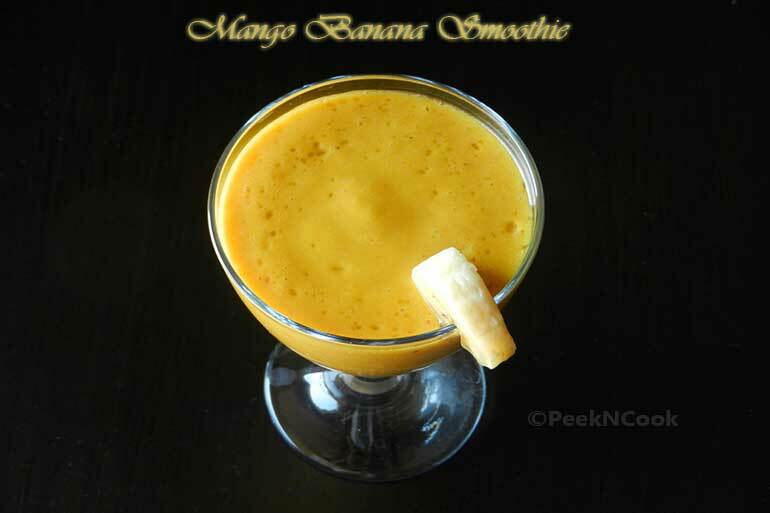 Now take a blender and put banana, mango & sugar in it and blend to make a smooth puree. Now add milk and ice cubes to it and blend again. At last add the Ice-cream to it and blend for 5 seconds and serve.